Students sit at the new solar tables on the Starbucks patio. The new tables have charging stations that allow people to charge their electronics. Photo by Abby Glaws. The SGA Student Initiatives Board has implemented new solar panel tables on the Starbucks patio to answer students’ wishes. The solar tables, constructed from purely recycled materials, are completely self-sustaining, running only on solar energy. They feature six outlets, four phone-charging panels and overhead LED lighting, improving sustainability on campus. The idea for the solar tables came from Butler students who wanted power for charging devices on the Starbucks patio. 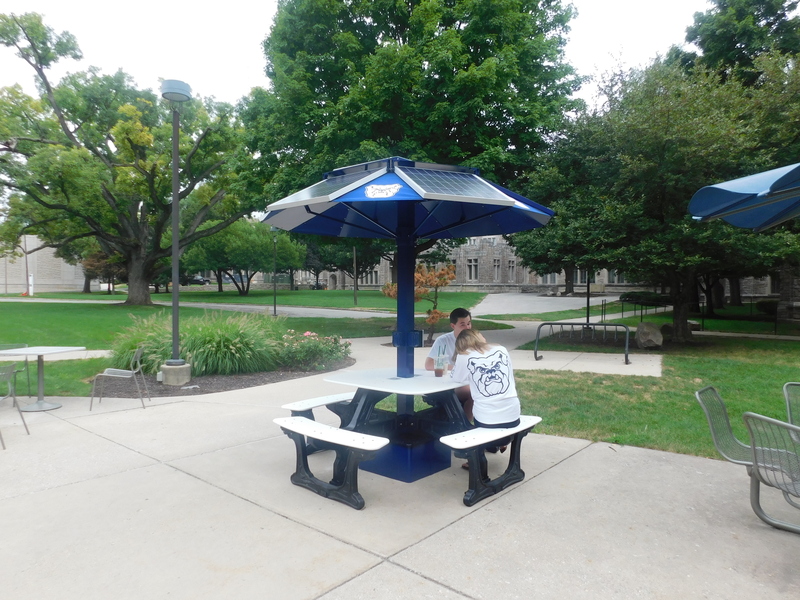 John Lacheta, SGA Vice President of Student Initiatives, saw the solar tables at another university and, after researching, found the tables fitted the needs of Butler students. Additionally, the usage of solar energy will eliminate greenhouse gas emissions. Lacheta said he can’t find any negatives regarding the solar tables. “We really did our research and made sure to get a great warranty package,” Lacheta said. When researching with the company on the solar tables, Lacheta wanted to be sure the tables would survive the many fluctuations of Indiana winter. The solar tables will still work in the winter, providing students with outdoor power sources all year long. Students can expect two more tables to appear on campus soon. SGA asks students to talk to their senators about where they would like to see more solar tables on campus. Julia Angstmann, director of the Center for Urban Ecology, said she believes the best benefit of the solar tables is that they will be a great tool in educating students on sustainability and behavioral interventions that impact sustainability the most. “While the tables won’t make a huge dent in GHG emissions, the tables will make people think of sustainability which is the huge educational part of these solar tables,” Angstamann said. Angstmann added that if each student charged their phone via solar panel each day for a year, the university would save the equivalent of 800 gallons of gasoline worth of emissions. In the Butler University Sustainability and Climate Action Plan and through Butler 2020, the university has plans to continue making green changes and improvements on campus. With the addition of the solar tables students can now feel that they are directly playing a part in campus sustainability.